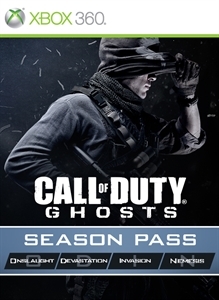 The Call of Duty: Ghosts Season Pass is your access to four epic 2014 Map Packs at one great price*. For purchasing the Season Pass you will also receive the Team Leader Digital Pack items unlocked in-game at launch. Xbox One Season Pass guarantee is also included if purchased by 5/31/2014. Download content from the in-game store, not the Xbox Live Marketplace, to avoid extra charges. Xbox360 and Xbox One Season Passes each require owning their respective versions of Call of Duty: Ghosts; sold separately. *Save vs buying 4 map packs a la carte.